2. Place all filling ingredients into a food processor and blend until smooth. Set aside. 3. In a stand mixer or with a hand mixer cream together butter and sugar. 4. Add milk, egg and vanilla and continue to mix. Scrape down sides of the bowl. 5. In another mixing bowl, whisk together flour, baking powder and salt. 6. Pour flour mixture into the butter mixture and mix until evenly blended and a dough forms. 7. Divide dough into two discs, wrap in plastic wrap and refrigerate for 1 hour. 9. Bake cookies for 6 to 7 minutes or until cookies barely begin to brown around the edges. 11. Lightly flour a clean surface and roll 2nd disc of dough to 1/8” thickness. 12. Using a 2” or 2.5” circle cutter punch out 36 circles. Then using a 1/2” circle cutter, punch out small circles within the bigger circles to create a doughnut shape. 14. Bake cookies for 6 to 7 minutes or until cookies barely begin to brown around the edges. 15. Remove from heat and transfer onto a cooling rack. 16. 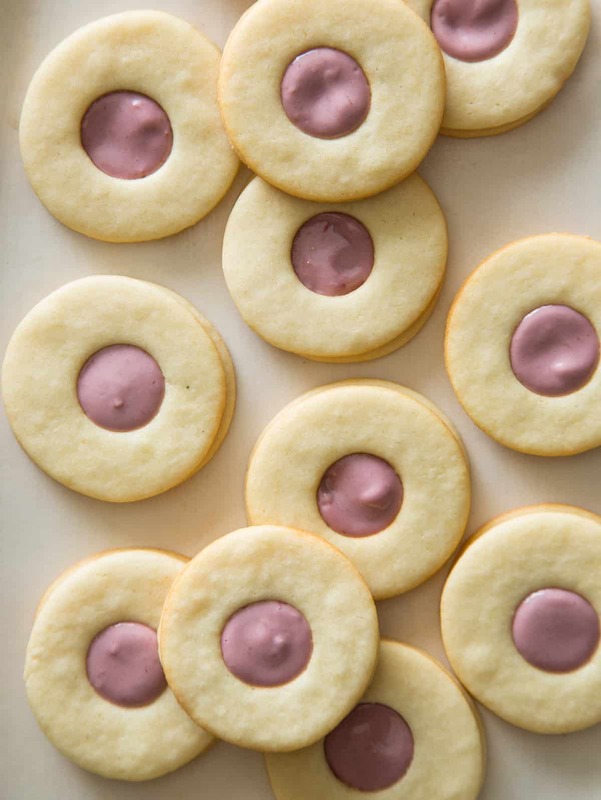 Once cookies have cooled, spread 1 1/2 teaspoons of the raspberry-tahini filling into the center of the first set of cookies. Top each cookie with a doughnut shaped cookie and serve. So pretty! Heading over for the recipe!